Thanks a lot for visiting my Kloset today my loves! The last day of SWIMMIAMI did not start off well for me. I had a ridiculous migraine and honestly did not know how I was going to make it through the day. Somehow, I managed to get ready and make it to the shows. I'm glad I did because I got to snap a pic with one of my favorite celebrities that day! Hope you make it to the end of the post so you can see who it was. The day 3 shows were Tavik, Versakini, Cali Dreams, Baes and Bikinis and Indah. At the start of the first show, I honestly could not believe the trip was coming to an end! I prepped so much for it and the feeling you get when something you have prepped for is coming to a close really hit me. I had a great time and was so happy my migraine went away by the second show. I sat in front of my Kloset for a few hours trying to decide what to wear on this day, but at the end, I went with a bold red jumpsuit to end Swim Miami on a bright note. We shot the look at almost sunset so it made the jumpsuit pop even more. Kudos to me for shooting this look with a headache lol. Bloggers gotta do what they gotta do, right!? All you blogger babes always inspire me with your hard work, and I imagine there are times you are doing shoots with headaches or body aches. That's what I call boss-like! Tavik was a fun show with a trendy swimsuit line. I was in love with all of the one-pieces because they were unique and made one-pieces super fun to wear. One-pieces have made such a comeback lately, don't you agree? This show was an ocean wave of pastels and light tones. Some of these pieces were perfect to transform into a night time outfit. I love how versatile the designs were. What are some things you guys look for when picking out swimsuit? Baes and Bikinis had a lot of, say it with me, babes in bikinis, lol. The designs were both modern and elegant. The designer did a really cool job of accessorizing the models, and the looks were completed with giant flowers on the model's heads. Shout out to them for keeping balance down the runway! What are some of your favorite accessories to complete your swimwear looks? The last show of the night was Indah! The house was packed for the amazing collection of Indah. This one was one of my favorite shows of the night, and really the entire week. I loved every single look from the collection. This was a great ending to the last night. 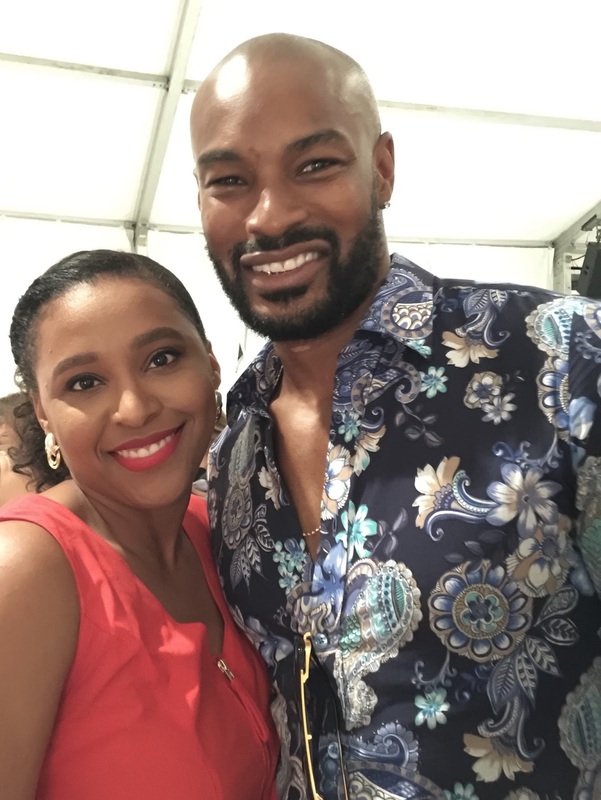 I got to snap a picture with Tyson Beckford! He was super chill and super cool. That is a wrap on SWIMMIAMI! Woooo! Thank you guys for rocking out on my Miami adventure. Big thanks to SWIM MIAMI for inviting me to such amazing shows. Until next year! Love you! I always remember... I have the video! Haha I'm glad I got to snap the pic! if you pick up dresses,glamgown dresses for graduation ceremony reviews gives you amazing choices.